Oxycodone is a common pain medication sold under the brand name OxyContin, among others. It is an opioid narcotic prescribed for moderate to severe pain and is sometimes formulated in combination with acetaminophen (Percocet) or aspirin (Percodan). Unfortunately, oxycodone has a high potential for abuse and addiction. Who Answers? . A rehab support specialist is available to take your call anytime and answer questions about insurance. Oxycodone can safely help manage pain when used following appropriate prescription guidelines. However, when it is abused, it can cause serious harm – even overdose and death. 1 Many people who abuse oxycodone by taking more than the prescribed dose or by using it recreationally to get high are at risk of developing a dangerous addiction. Appearing sedated, drowsy and nodding off. Using more than prescribed and running out of medication quickly. Becoming anxious or agitated if the drug is not available. Seeking prescriptions from multiple sources (“doctor shopping”). Stealing to pay for drugs (money or items to be sold). Using the drug other than as it was intended to be used (snorting, injecting). There is no specific amount of time attached to how quickly a person becomes addicted to oxycodone. Taking for a longer period than prescribed. Using in a non-prescribed way (crushing and snorting or injecting). Prescribed for a medical procedure. It is possible to become addicted to oxycodone after being prescribed the drug for pain management after surgery or an accident. Even if you take the drug as prescribed, you can develop a dependence. Genetics. A family history of addiction puts a person at greater risk even when they are using medication appropriately. Always let your physician or prescriber know if you have a family history of addiction or have previously been treated for addiction. Misuse. Some people report becoming addicted to oxycodone because they took someone else’s pills in an effort to alter their mood. This is misuse of medication and is also against the law. Oxycodone affects everyone differently. One person may become addicted while another won’t. This is one reason why it is important to work closely with your doctor if you are given oxycodone for pain management. Cost will depend on the services you choose, insurance, length of stay and location. Treatment for oxycodone addiction will vary in cost. The actual cost will depend on what types of services you choose, your insurance coverage, your length of stay and where the program is located. If you have insurance, call 1-888-319-2606 Who Answers? to determine what your coverage is for substance abuse treatment. You should also ask what form of referral, if any, is necessary in order for you to obtain coverage for treatment. Your insurance company should have a list of approved providers to assist in your search. Some treatment centers will work out a payment plan before treatment begins. And you can also visit the Substance Abuse and Mental Health Services Administration’s (SAMHSA) website to find more information on recovery centers in your area that offer low-cost treatment. If you are considering treatment for oxycodone addiction, start with an assessment by a professional experienced in substance abuse treatment. You will receive a clinical evaluation and also suggestions on treatment. The length of a treatment episode will vary depending on your situation and other factors, such as your insurance. Inpatient rehab – Inpatient usually consists of a 28-day or longer program that has a medical component (including medication-assisted treatment) and is able to provide on-site detox and management for diagnosed mental health issues. These programs usually include group and individual therapy and 12- step meetings. Intensive outpatient treatment (IOP) – Intensive outpatient treatment is frequently suggested as a step-down after a period of time in rehab. However, some people benefit from using it as a primary treatment, and it is more flexible than inpatient. In addition, some people may combine outpatient recovery with medication-assisted therapy that includes methadone, Suboxone or Subutex. Narcotics Anonymous – Narcotics Anonymous (NA) is a 12-step support group based on the tenets of Alcoholics Anonymous. It is open to anyone who has a desire to stop using drugs. It is self-supporting, and no professionals are involved. Dual diagnosis programs – It is common for people with a substance use disorder to receive a dual diagnosis – meaning they may have a mood disorder such as depression and are also suffering from substance use disorder. This diagnosis needs special treatment at a facility able to manage mental health concerns. Treatment goals will involve addressing areas of work, family and community. Hopefully there will be reduced criminal activity and resolution of existing charges, if any. Behavior modification is used both in inpatient and outpatient settings to assist in changing old patterns and habits. Individual outcomes are contingent upon compliance with treatment, with treatment plans and suggested follow-up services or aftercare. Remember that treatment by itself is not enough. You will need to be vigilant about your environment when you are discharged, and you may want to seek individual counseling after you have been abstinent from oxycodone. 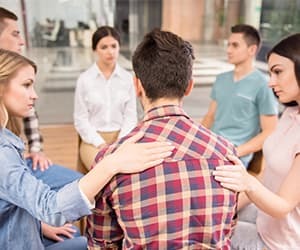 You may also want to get involved in a mutual support group such as NA or SMART Recovery. Addiction is considered by many to be a chronic disease that has a disruptive effect on the brain. Like many other chronic diseases, it can be managed. Relapse should not be looked at as a failure of treatment. If relapse occurs, it is an indication that treatment needs to be reevaluated and continued. Withdrawal from oxycodone may begin 6-12 hours after the last dose, depending on the amount being used and the length and manner of use. Some people are able to detox from oxycodone on their own. But it is better to be monitored in some way, and it improves your chances of a successful recovery. There is no standard protocol for tapering from opioids, but medical guidelines exist. 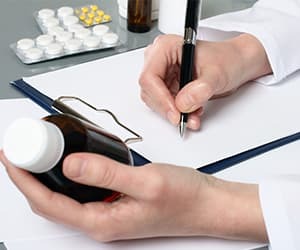 Tapering, or weaning a person off oxycodone, should only be done with the involvement of a physician who is familiar with the management and reduction of pain medication. Each individual has a different use history, chemistry and support system. All of these factors should be considered when beginning to taper off oxycodone. Who Answers? anytime to get more information on oxycodone addiction treatment programs in your area and find out what your insurance will cover. Dependence on oxycodone will result in physical and psychological changes. These symptoms will differ in their severity depending on how long, how much and in what manner a person has used the drug. Heavy feeling in arms and legs. Withdrawal when the drug is reduced or discontinued (sweating, diarrhea, restlessness, anxiety, insomnia). Liver damage (risk is pronounced in those abusing the acetaminophen formulations). If the drug is being injected, there is the added risk of HIV/AIDS, hepatitis B and C, heart infection (endocarditis) and other systemic infections. Oxycodone has been cited as the drug of choice for numerous celebrities. It is a commonly prescribed medication that affects a large number of people from all walks of life. Courtney Love, Cindy McCain, Winona Ryder and Steven Tyler are other celebrities whose addiction to oxycodone has been made public. Can I Break an Oxycodone Addiction Using Methadone or Suboxone? Medication-assisted treatment (MAT) can help people recover from addiction to oxycodone. For the treatment to be most successful, it should include medically supervised dosing along with counseling and the support of family and friends. MAT is considered by some to be the best choice for opioid addiction, particularly if the history of use has been a year or longer. Some misconceptions about the use of these medications is that they are like trading one addiction for another. While they will need to be tapered eventually when you choose to stop taking them, replacement therapy gives an addict an opportunity to focus on getting his or her life back together. Both methadone and Suboxone? (buprenorphine/naloxone) are prescribed medications that stimulate opioid receptors, allowing people to feel more normal (not high, but also not in active withdrawal) and reducing cravings. Naltrexone is another drug that is used to block the effect of opioids. It does not allow a person to feel high if the drug is used, which makes it a good choice to help prevent relapse after treatment. Further, it minimizes the risk of overdose, should someone relapse. While in treatment, people are encouraged to look at factors in their lives that contributed to their addiction. Treatment helps people move into recovery where they cease illegal activity, have safe medication, reduce the risk of contracting disease from contaminated needles and regain a sense of self. Does Oxycodone Addiction During Pregnancy Lead to Birth Defects? Is Oxycodone Addiction a Problem in the Elderly? This report also indicates that cognitive decline in older patients might cause them to misuse their pills. Financial issues such as being on a limited income might influence them to use somebody else’s medicine. They might also have additional health issues, changes in metabolism and be at higher risk of experiencing negative interactions with other prescription drugs. Prescription drug abuse among older adults was recently addressed in “Take as Prescribed,” a film on Al Jazeera America’s “Fault Lines” that premiered on August 31, 2015. It looks at the lives of several senior citizens who developed dependence on opiates. If you recognize any of the above signs and/or symptoms of oxycodone abuse in yourself or someone you love, call 1-888-319-2606 Who Answers? to speak to a trained treatment support representative. They can address your concerns and answer questions about treatment options. They can also provide information on ways to pay for services.
. U.S. Department of Health and Human Services, FDA U.S. Food and Drug Administration. Opioid Medication.
. Volkow, N. (2016). What Science tells us About Opioid Abuse and Addiction.
. Department of Defense, Department of Veterans Affairs. (2013). Tapering and Discontinuing Opioids.
. Substance Abuse and Mental Health Services Administration (SAMHSA). 2009. Medication-Assisted Treatment for Opioid Addiction: Facts for Families and Friends. HHS Publication No. (SMA) 15-4443. Revised 2011, 2013, 2014, and 2015.
. National Institute on Drug Abuse. Substance Use in Women, Substance Use While Pregnant and Breastfeeding.
. NIH. National Institute on Drug Abuse. 2014. Prescription Drug Abuse, Older Adults.
. Dan Childs. A Closer Look at Heath Ledger’s Killer Combo. ABC News, February 6, 2008.
. Jarrett Murphy, Rush Limbaugh Arrested On Drug Charges. CBS News, April 28, 2006.